What are foundation engineering guidelines? They’re what contractors follow having making foundation repairs in local soil, including North Texas. The following are guidelines established by the Texas Section of the American Society of Civil Engineers for the evaluation and repair of residential foundations. These pros lead the way when it comes to foundations, and that’s why foundation repair contractors in all parts of the state, including the northern and southern areas, follow them. 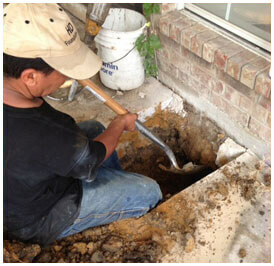 They also apply to repairing foundations that are in Dallas and Fort Worth area dirt. Please bear in mind that these engineering guidelines are just that — guidelines, and are not intended to be interpreted in any other manner. These guidelines were adopted in 2009, are being used with permission and are subject to change. Texas has large areas with clay soils that shrink and swell with changes in soil moisture content. This shrinking and swelling may cause movement of residential foundations and adversely affect the residence. Other factors may influence foundation performance. Some of these factors are inadequate design or construction, unanticipated loads, deterioration of materials, compressibility of the supporting soils, landscaping practices, leaking plumbing and slope instability. The most common purpose is to assess its performance. This involves observation and evaluation of cosmetic distress and structural damage. If the evaluation determines that remedial measures are appropriate, the engineer may be asked to provide the design and construction documents. A professional engineer licensed in the State of Texas shall perform the evaluation and repair design. Engineers in responsible charge of this type of work must be competent to apply scientific and engineering education, training, knowledge, skill and experience to the investigation and analysis of constructed facilities. This determines the cause and extent of diminished performance and the means of remediation. Contractors fixing foundations need to be aware of all of this. It is essential to avoid conflicts of interest to maintain the credibility of the evaluation investigation. The evaluating engineer must demonstrate qualities of character that will ensure impartiality. These qualities include objectivity, confidentiality, honesty and integrity. (1) Interview the occupant, owner and client if possible, regarding a history of the property and performance of the structure. (2) request from the client and review the provided documents regarding the foundation, such as construction drawings, geotechnical reports, previous testing and inspection reports, and previous repair information. (3) make visual observations during a physical walk-through (4) observe factors influencing the performance of the foundation. If requested by the client, provide a written report, containing at least the following: (1) scope of services, (2) observations, site characteristics and data deemed pertinent by engineer (3) discussion of major factors influencing foundation performance and rationale in reaching conclusions concerning the residence (4) conclusions and any recommendations for further investigation and remedial or preventive measures. This level should include a written report including the items listed above and also the following items: (1) a determination of relative foundation elevations, considering floor finishes, in sufficient detail to represent the shape of the foundation or floor adequately. (2) drawings showing relative elevations. 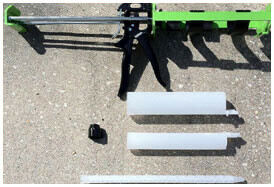 In addition to the items listed in Levels A and B, this level of investigation shall include additional services including, but not limited to: (1) site specific soil sampling and testing (2) plumbing testing (3) materials testing (4) steel reinforcing survey (5) post tension cable testing. Other things that may be included: (1) scaled drawing (2) description of factors that affect soil moisture (3) observations of cut and fill (4) tree survey (5) photographs (6) detailed distress survey. A rationale method should be used to establish causes of distress of diminished performance in foundations in the North Texas area and that’s part of following foundation engineering guidelines. A suggested method includes: (1) observe the structure, site conditions, other relevant phenomena, and collect pertinent data (2) analyze the date (3) formulate hypotheses (4) test the hypotheses using analysis acceptable in the engineering profession (5) reach conclusions or reformulate the hypotheses. Diminished performance of a structure may have several causes. The engineer should approach the analysis with an open mind. The analysis should follow a logical path to its conclusion. The evaluation should be quantitative to the extent practical, but should not assume greater accuracy or prevision than warranted by the data. Residential foundations are expected to remain reasonably flat and level to provide acceptable performance. The criteria herein are intended to lend rationality and reasonable uniformity, supported by a consensus of practitioners, to the evaluation of performance and the need for repair of residential foundations. The basis of these evaluation criteria is structural integrity and performance. Both may be affected by foundation deflection and tilt. Evaluations may be interpreted from the body of evidence or demonstrated by calculations. This considers the capability of the foundation to support its design loads as well as results and effects on other load bearing members of the superstructure in the Dallas and Fort Worth areas. Elements of concern are stability, component strength and condition, and material soundness. In evaluating structural integrity, it should be understood that in many instances portions of the foundation and other structural components may not be available for observation. Lack of structural integrity may be indicated by excessive deflection, cracking, partial collapse, loss of section, material deterioration, or demonstrated by calculations. If loss of structural integrity is demonstrated through calculations, the conclusion must be consistent with the physical evidence. Examples of lack of structural integrity include loss of shear capacity in concrete through excessive cracking, excessive tilt or structural elements such as posts or piers, unstable conditions in non lead-bearing masonry, and rotting of wood structural members. The engineer should evaluate the following, if they are observed: (1) Cracks. 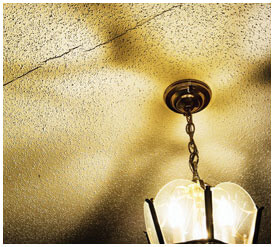 Cracks may make concrete structural members weaker, although the majority of cracks do not compromise structural integrity. (2) Tilting of posts or piers above grade. Tilting can affect structural integrity or stability, although posts or piers above grade designed for eccentricity of load can tolerate some tilting without overstress. However, ordinary construction tolerances may result in vertical members being built out of plumb. (3) Tilt of masonry walls or veneer panels. Excessive tilt can lead to masonry collapse. Masonry veneer or infill is normally non-load bearing, and in some cases the veneer or infill may not be held in place except by its own weight. Tilt large enough to cause the weight vector (or center of gravity) to fall outside the middle third of bearing load is sufficient to cause tension in masonry walls or veneer (4) Material deterioration – The strength of deteriorated materials may raise a structural integrity issues. Evaluation of material deterioration may be based on observation, material sampling and testing, or non-destructive methods. (5) Foundation Performance — considers the capability of the building to serve its intended purpose. Elements of concern are safety, function, durability and habitability. Inadequate foundation performance may result from inadequate strength of insufficient stiffness, and many visible indications include: (1) cracking or separating of exterior walls (2) rotating, buckling or deflecting masonry veneer panels (3) cracking of concrete foundation elements (4) cracking of gypsum board walls and ceilings (5) separating of walls from ceiling or floors (6) separating of rafters from a ridge board (7) racking of door and window frames (8) separating or racking of other structural framing (9) cracking, buckling or separating of floor coverings (10) separating of initially tight joints (11) deflecting or tilting of structural elements (12) deteriorating materials. Observation of some of the listed conditions does not necessarily imply inadequate structural integrity and performance. Either foundation deflection (bending or angle distortion) or tilt (planar rotation) may affect structural integrity and performance. Determining the deflection and tilt of a slab-on-ground foundation is an approximation without an as built or previous floor elevation survey, because the original surface configuration is unknown. Therefore, a floor elevation survey can provide valuable information, but should not be the only basis for evaluating foundation deflection and tilt. Deflection may be more difficult to evaluate quantitatively than any other element of performance. Deflection is characterized by the deflection ratio, which is defined as the maximum deviation from a straight line between two points divided by the distance between the two points. Overall deflection, as outlined below, may be more easily interpreted and evaluated than localized deflection. Localized deflection may be a more common occurrence. Foundation tilt is the planar variation from a level condition to one that slopes across the entire foundation. Tilt may be accompanied by deflection. Overall deflection necessarily involves the overall foundation dimension in a given direction. When additions have been made to a foundation, the overall foundation dimension should be considered for each separate foundation element and for the entire foundation. The amount of overall deflection is characterized by the deflection ratio. Building codes specify that structural members shall be designed to have adequate stiffness to limit deflections. The International Code Council International Residential Code TM for One-and Two–Family Dwellings specifies a maximum allowable live load deflection of any structural floor member of L/360, where L is the unsupported length of the member. This requirement typically is sufficient, in that in-service deflection will not result in excessive damage to cosmetic finishes, racking of door frames, or vibration. This deflection criterion may be appropriate for the analogous in-service deflection of a residential foundation, where for simplicity the entire foundation is considered as though it were a single structural member and differential soil movement is considered analogous to live load. A single floor level survey yields the shape of the foundation at one instant, and may not furnish sufficient information to support a conclusion. An evaluation may include repeated floor level surveys performed over months or years. In such cases, the change in shape is measured between surveys. In addition, previous foundation repairs may change elevation shapes. The engineer evaluating deflection must consider the floor level survey and other indications of movement, such as: (1) brick coursing not level (2) poor door alignment (3) levelness of built-in horizontal surfaces such as cabinets, countertops, sills and trim (4) cracking of exterior and interior wall finishes may indicate deflection, as do most items listed above. If a foundation profile indicates the deflection is less than the analogous deflection limit of L/360, it is unlikely the foundation is deflected materially unless visible indications show otherwise. If a foundation profile indicates the deflection is more than the analogous deflection limit of L/360 and minimal symptoms of deflection are present, then additional information is needed by the engineer to develop a conclusion. Following these guidelines is important. The additional information may allow the engineer to determine whether or not the foundation has deflected excessively. Localized deflection means a change from original profile or shape in an area smaller than the overall foundation. Localized deflection manifests itself in similar ways as overall deflection. It sometimes results in localized structural integrity or performance problems. The engineer should evaluate the significance of localized deflections and their consequences as, but caution is advised when evaluating floor deviations over only a few feet because built-in unevenness can dominate. Foundation tilt can affect structural integrity and performance., as outlined int he foundation engineering guidelines and Texas. Tilt of entire foundations may be evaluated for structural integrity using the criterion stated for veneer panels. Foundation tilt, deflection, or both may result in floor slopes that affect comfortable or convenient use of the building. A floor slope greater than 1% is usually noticeable. The Americans with Disabilities Act considers a 2% slope too large. If the residence is found to be unsafe due to structural inadequacies, the client and/or civil authorities should be informed immediately. The engineer should recommend repair, restoration, remediation, adjustment, or use alternatives if the structural integrity is inadequate. The engineer should provide alternatives for the client’s consideration if performance in inadequate. Recommendations and alternatives should be commensurate with the nature and cause of the inadequacy, and the seriousness of its consequences. The engineer should consider the cost effectiveness and practicality of the recommendations, the projected performance, and the needs of the client. For example, an owner may choose to perform periodic cosmetic repairs and door adjustments, rather than comprehensive foundation underpinning. Risks of continued diminished performance are involved in all remedial measures. The engineer can, however, provide recommendations for remedial measures that reduce risk. Not implementing the entire remedial plan may increase such risks. The report provides a record of the investigation, analysis and conclusions. Report formats may vary, but should contain pertinent information that was obtained or generated during the investigation. The following list includes items that may be included in the report: (1) authorization and scope (2) property location and description (3) sources of information (4) data (5) assumptions (6) analysis of information and data (7) conclusions (8) recommendations (9) limiting conditions. The objective of the engineer should be to design and recommend cost effective remedial measures for the foundation as part of the guidelines. Remedial measures should address diminished structural integrity and performance identified during the evaluation process. Recommendations for remedial measures should include a clear description of what the remedial measures are intended to accomplish. Perfection is not attainable for remedial measures. Recommendations for remedial measures should identify important or significant limitations of the measures, and should comment on reasonable expectations of the remedial measures. The engineer who provides sealed remediation documents or plans and specifications shall be the engineer of record and shall have approval authority over any changes. The Texas Engineering Practice Act and Rules adopted by the Texas Board of Professional Engineers prohibits the practice known as “plan stamping” by requiring that engineers seal only work done by them or under their direct supervision. Conscientious watering program – The client should be informed that maintaining near uniform soil moisture conditions near all sides of the foundation may be beneficial. Caution should be advised against excessive overwatering. 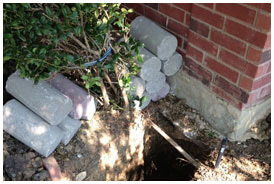 Vegetation alteration – Trees or large shrubs near a foundation may cause soil shrinkage under the foundation. Removal of these trees or shrubs may stop shrinkage or lead to partial restoration of settled areas of the foundation. Removal may result in upheaval caused by soil moisture increase, especially if the tree predates construction. If trees ae removed, a suitable waiting period may be recommended to allow for soil heave. Root barriers – Root barriers or periodic root pruning may mitigate the effects of vegetation. Root barriers are generally not as effective as tree removal. Gutters and downspouts – Uncontrolled roof runoff can cause erosion and ponding of water near the structure, which can be mitigated by the addition of gutters and downspouts. Downspouts should be extended well past the edge of the foundation, past the edge of abutting planting beds, and into well-drained areas. Surface grading – Where practical, for adjacent ground exposed or vegetative areas, a minimum slope of 5% (i.e. 6″ in 10′) away from the foundation should be provided for the first five feet all around. Swales should have longitudinal slopes of at least 2% (i.e. 6″ in 25′), if practical, and 1% (i.e. 3″ in 25′) at a minimum. Erosion control – The remedial documents should indicate locations where fill, ground cover or retaining structures are to be added. Surface water drainage – When surface drainage cannot be improved adequately by grading, or when otherwise appropriate, solid pipe drainage systems should be specified. The ground surfaces should be graded to slope to one or more drainage inlets. Cleanouts should be provided for maintenance. Downspouts may be connected to solid pipe drainage systems, if the pipe is large enough for the hydraulic load of roof drainage. Subsurface water drainage – Elevation adjustments by jacking or lifting atop underpinning elements may be applicable when floor slopes are excessive, or when the design requires that the foundation be lifted clear of expansive soil. Elevation adjustments should be governed by field judgement to limit damage to the foundation and finishes. It is unlikely that elevation adjustments will result in a level foundation. Grouting and mud jacking– In general, grouting provides continuous slab support without lifting appreciably. Mud jacking is done to adjust elevations of a foundation hydraulically with continuous uniform support. Grouting or mud jacking may be accomplished with temporary support atop shallow footings or long-term support atop deep piles or piers. Grouting or mud jacking should not be performed beneath underpinned foundations if expected swelling of the soil in the injected area is sufficient to damage the structure. Crack injecting – Injecting slab cracks of about 1/32″ and larger with epoxy repair cement is intended to restore stiffness across the injected crack. If the objective of the repair is solely to limit moisture intrusion or insect ingress, then alternative materials, such as sealants, may be appropriate. Tendon stressing – Stressing relaxed or inadequately stressed post-tensioned tendons may be applicable where tests show tendon forces below those specified in the original design or by applicable authority. Stressing may restore the residual prestress in the concrete, and should be performed after elevation adjustments and epoxy crack injecting, if any. Repair of pier and beam foundations – These foundations consist of structurally supported floor systems atop piers, posts or footings. Repairs may include shimming the floor framing atop the existing supports, repairing or strengthening the floor framing, replacing or adding supports, and re-establishing void space. Floor shimming– Floor framing may be adjusted by the addition of shims atop pier caps. Hardwood or steel shims may be used to fill gaps. 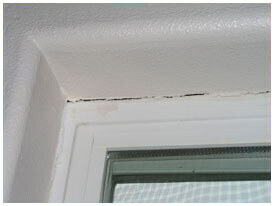 Framing repairs – Structural members that are damaged or distressed should be replaced or reinforced. Treated lumber is recommended for general use in framing repairs. Additional supports – Additional supports can be installed when beam or floor framing spans are too great for the design loads, or when existing supports have deteriorated or are otherwise ineffective. Void spaces – Void spaces designed under foundation elements should be re-established as necessary. Under-floor crawl space moisture control – Measures include crawl space cross ventilation, under-floor drainage, floor beam and floor joist ground clearance, and treated lumber. Post lift plumbing test – Water supply and sanitary drain lines should be tested for leaks if jacking or lifting is included in the remedial measures. Gas service lines may require adjustment. Leaks found by such testing should be repaired. 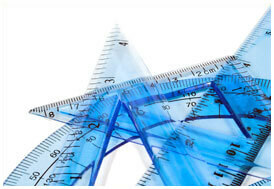 Floor elevations – Floor elevation measurements should be made after implementation of remedial measures. The engineer should keep a record of these elevation measurements and furnish a copy to the client. Moisture barriers – Vertical or horizontal moisture barriers may be effective to mitigate moisture migration under the foundation. Moisture barriers may consist of durable impermeable plastic sheeting or other appropriate materials attached to the foundation. Structural remedial measures may be necessary to improve foundation performance. 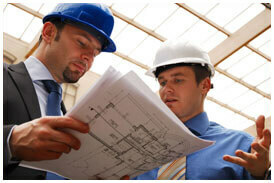 The engineer should provide documents or plans and specifications that show specific details of the remedial measures. Plans should be specific for the project and be based upon generally accepted engineering practice, including appropriate engineering calculations. Remediation documents should include the following: (1) the site address (2) the engineer’s name and the firm’s name, address, and telephone number (3) the client’s name and address (4) the purpose and limitations of the remedial measures (5) available geotechnical information and source (6) a plan view of the foundation locating known relevant and structural components (7) details to show how to construct repair components (8) specifications to identify appropriate materials and methods (9) requirements for construction observation or testing by the engineer or others. (10) existing floor elevations or contours and elevation adjustment requirement, if appropriate. (11) the requirement for performing a floor elevation survey after completion of the remedial measures (12) site restoration requirements. The engineer designing structural remedial measures will need geotechnical information. In some cases, geotechnical information may be derived from successful local practice, or other experience, verified during construction. For major or comprehensive remedial measures, geotechnical information should be derived from a site specific boring and testing program tailored to the project’s needs. Concrete slab-on-ground foundation repair methods include, but are not limited to: underpinning, grouting, mud jacking, crack injecting, tendon stressing and partial demolition and reconstruction. The plans should show or specify locations of underpinning elements and their sizes, depths, material types and minimum required material strengths, if appropriate. Underpinning design shall be based upon generally accepted engineering practice and appropriate engineering calculations. Performance of underpinning can be compromised by integrity of existing slab components, changes in soil moistures, skin friction, point load and other factors. Underpinning part of a structure may be specified if calculations, tests, or experience show that the unsupported structure can support its design loads. The construction documents should state that underpinning would not improve the performance of the foundation in non-underpinned areas. Upon satisfactory completion of the remedial measures, the engineer, if retained to do so, should provide a letter of substantial completion to the client stating that to the best of the engineer’s knowledge, the remedial measures generally conform to the remediation documents, including approved changes. Deviations from the remediation documents should be noted in that letter. Do you want to know more about how engineers evaluate or inspect DFW area houses for foundation problems and issues? If so, contact the company that does excellent repair work and can recommend local professionals with a solid engineering background….